I took a break from stamping today and thought I would play with beads. Beading is another addiction I have and LOVE every minute of it. Well, almost every minute. When the thread gets a knot it's not fun but other than that I really enjoy it. It is extremely relaxing and fun too! 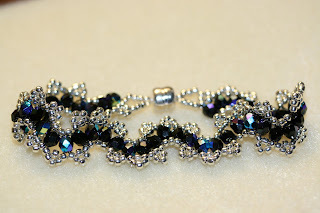 This bracelet is called Serpentine Lace. I didn't design it but I do SO love making it. It is a bit tricky to start out but after a few of the bends in it, it's not bad. It's SO pretty. I have made this design before. I did one with red/garnet fire-polished beads in the middle part and one with cobalt blue round beads in the middle. To get a closer view of this bracelet just click on the photo. This one will be going in my web store later in the week. I need to get the specs of it entered along with the shipping weight so the store can figure out the postage. Nothing is ever easy, is it. Anyway, I had a lot of fun making this bracelet and I do plan on making a few more before I get tired of the pattern and try out a new one. I have a lot of bracelets in other styles on hand and will be starting to put them in the store too. I mean, how many can you keep for yourself? I have one I wear all the time and it goes with everything I wear. I'll wear it until it falls off and I lose it! But then again, I'll just make another one because I really like it! Very beautiful braclet, Wanda. I don't do beading, but I enjoy seeing the designs. Thanks for sharing. That is absolutely gorgeous Wanda! Wanda what a wonderful bracelet love the black and the lace effect. Great job!